Unit 3's list includes the following words: we, like, and, and at. The noun for this unit is pig. There are over a dozen practice activities to choose from, as well as end-of-the-week assessments. This word list includes an at-home sentence building activity that kids can try with their parents. First, read each sight word. Then trace. They can try to write it neatly on their own. Trace each of this week's sight words two times. Practice writing each of the words twice. Use scissors to cut out the sight words and rearrange them on the page to make a complete sentence. The sentence should read, "We like this pig." 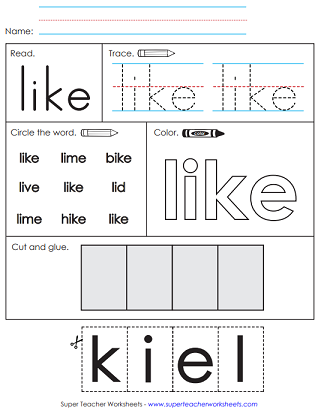 Your students can use letter ink stampers to make sight words. This page can be used as a fun learning center. This PDF has five sentences for students to read. Each sentence is created from sight words in units 1 through 3. 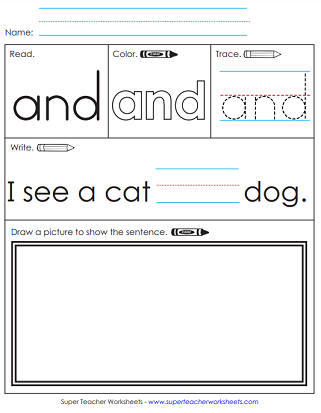 The first three Units of our Sight Word series are listed on this worksheet for students to review. Learn all about reading and writing the word we with this printable worksheet. Trace, write, and color the word like. Then cut out the letters, unscramble them, and glue them on the page to make the word. Write the word and in the blank space to make a complete sentence. "I see a cat and dog." Find and circle the letters in the word at. Complete the color-by-number. Write. Trace. Cut and glue the letters p-i-g. Trace and print the word pig on the primary-ruled lines. Within this file, you'll find word cards for this unit. These long word strips will fit perfectly in your classroom pocket chart. Or, add them to your class word wall. Give each kid a copy of this test paper. Read words and have the kids circle them. 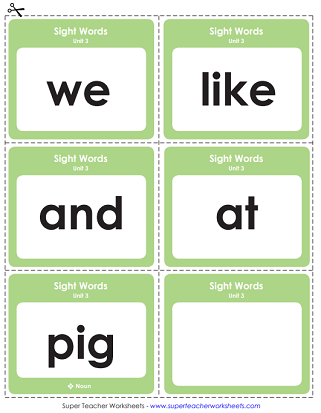 Download the entire list of words for all 30 STW Sight Word units. Next week's unit has the words: you, in, am, do and ball.